The Little Falls Penguins are proud to be a part of Team Hydro! Click HERE to see our swimmers giving back to this amazing organization. In an amazing show of dedication, compassion, and incomparable support, the Mighty Penguins of Little Falls will once again take to the water to raise awareness and funds for Hydrocephalus Research! On July 5th, the swimmers will dedicate an entire practice (up to two hours) to swim as far as they can as a team in an effort to fund important research for this difficult condition! This amazing community swim team, made up of swimmers aged 4 to 18, is demonstrating true leadership in action by once again committing to hold a Swim for Hydrocephalus event, where they hope to exceed their fundraising goal of $7,000! As with all Team Hydro Swims, 100% of funds donated will go directly to fund hydrocephalus research! But, the Penguins won’t just be raising funds–This Team has become a committed group of leaders with regard to Raising Awareness for Hydrocephalus as well! During the summer, the Team will take part in educational activities designed to increase their understanding of the condition. They will make cards for hospitalized patients, read personal stories of people who have passed from or are currently living with the condition, and will honor them by swimming wearing personalized hospital bracelets of support. The kids will learn how to talk about the condition to others, and just by becoming informed will help reduce the stigma patients with the condition often encounter in their lifetimes! We could not be more honored to swim alongside this dedicated Team of Swimmers–you are amazing advocates for the Cause! Keep checking back as the season continues , to learn more about Little Falls and their Swim for Hydrocephalus! To learn more about Little Falls affiliation with Team Hydro, continue reading below! When Kate was born severely prematurely, she suffered a stroke which caused her to develop hydrocephalus. This same stroke also caused her to acquire some physical difficulties including hemiplegia, where one side of her body did not work as well as the other. In order to combat this difficulty, Kate’s parents encouraged her to learn to swim at an early age as a form of physical therapy. Because swimming required her to use both sides of her body equally, it proved to be a great form of exercise for Kate. What her parents never anticipated however, was what a wonderful experience swimming would be for every other aspect of Kate’s life. When Kate was six, she had the great privilege of joining her neighborhood swim team in Bethesda Maryland–The Little Falls Penguins! Though a skinny awkward little girl with medical challenges, Kate was welcomed onto the team with the same gusto as any other neighborhood child! What a joy that was for Kate! She attended practice regularly and under the guidance of wonderful coaches and doting older teammates, Kate learned from example the importance of hard work and determination, of team spirit and dedication. Alongside a wonderful group of teammates, Kate grew and developed as a swimmer, and a person! Kate loved being a Penguin, just as she treasured her subsequent experiences with the ASIJ and Del Amigo swim teams after the family moved from Maryland. The lessons she learned and friendships she developed while swimming were among the most meaningful and joyous of her life. Even as complications from her illnesses continued to mount, Kate often credited her experiences with Swim Team as having provided her with strength and values upon which she continued to rely and build as she faced challenges to the end. Using their Strength to Serve: Little Falls Penguins to Swim for Hydrocephalus! 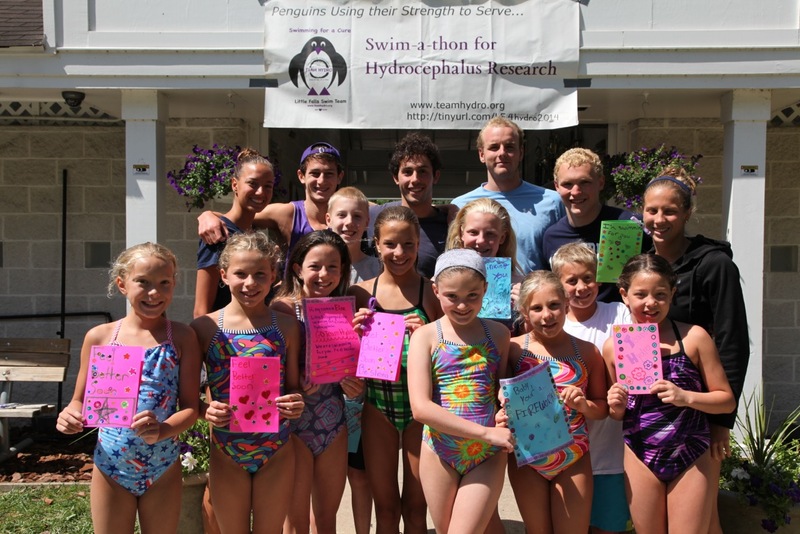 (From 2015) Team Hydro is proud to announce that The Mighty Penguins of Little Falls Swim Team will once again take to the water this summer to raise funds and awareness for Hydrocephalus Research! For the 4th year in a row, this amazing summer recreational Swim Team from Bethesda, Maryland will put their personal racing goals aside, and instead hold a Swim Fundraiser for Hydrocephalus Research!